Salem Lake 2011 30K: What Just Happened?? I have been staring at my laptop for 10 minutes, trying to figure out how to tell this story. Is it a story of defeat? A story of triumph? Yes and yes. I guess the best way to tell it is to just dive in. Yesterday I, along with many friends, participated in the Salem Lake 30K trail run. I only signed up for the race Wednesday night with the goal to redeem myself from last year's horrid run. I wanted to run a better race this year and PR (set a new personal record). Did I succeed? I have no idea how to answer that. 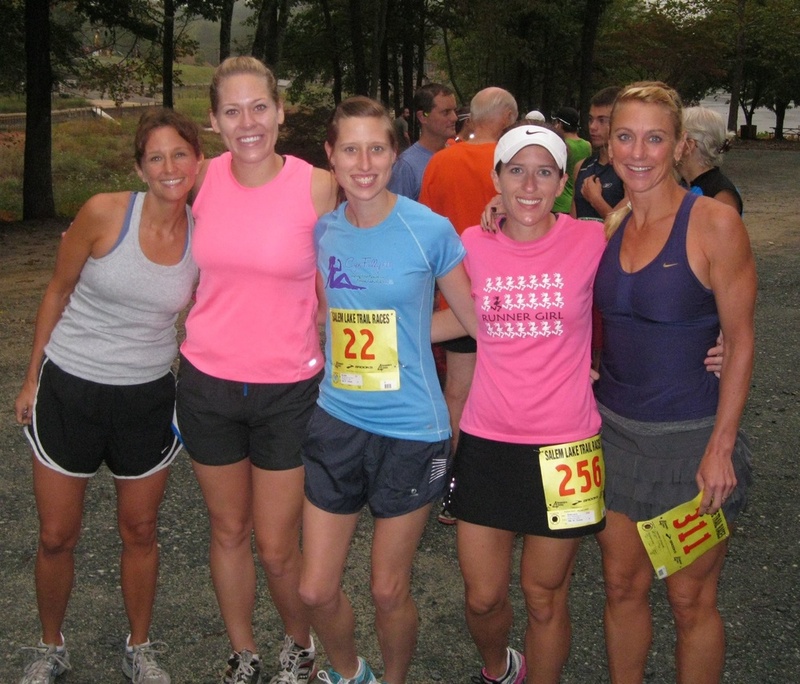 With my Sole Sisters before the race, when anything seemed possible...Here's what happened. Per my marathon training plan, I was scheduled to run 15 miles at an 8:20 pace. Since I was adding 3.6 miles on trail, my thought was I would run the race around an 8:30 pace. This, as we shall see, was a fatal combination of stupidity and arrogance on my part. Upon arriving at the race, we were all informed that given all the rain we've had this week, the upper part of the course was flooded and they were rerouting us. What I heard was that we would circle the lake twice (a 7-mile loop) and then do a little out and back to make up the rest. The director said the new course was closer to 19 miles. It started thundering and raining about 15 minutes before the race began and we all knew we were heading into a mud pit. That part didn't bother me. I enjoy running in a hard rain. We started the run and by mile 3 I knew something was wrong. I shouldn't be struggling this much to hold pace at mile 3. Maybe it was the extra focus and energy it took to navigate through the mud and muck, maybe it was because I'd worked out the day before, or maybe it was the fact that trail runs are harder than pavement runs. Regardless, those 8:30 miles were coming with a price tag attached. When I did a 10-minute mile around mile 5, I was like, "Crap, crappity-crap." I let go of any thoughts of a PR at that moment. Jut not my day. I completed the first lap and plunged back in for the second. About halfway around, maybe at mile 9, I started debating whether this race was going to be my first DNF (Did Not Finish). I just didn't have it in me to keep running. Especially when, on the back part of the course that was pure mud--I clocked in with an 11:43 mile. My plan was to stop running at mile 14, when we would circle back by the Start/Finish line. I rationalized that since I was only supposed to run 15 anyway this weekend, 14 was close enough. I felt bad about quitting, but not bad enough to not do it. I was actually composing a blog post in my head as I ran about why I chose to take my first DNF. Then a couple of things happened. The first was that I realized I had heard wrong about the course. We didn't make a complete second lap, instead turning around about a mile and a half away from the Start/Finish line and running back the way we came in. There was a water stop there and I probably stood there a good 15-20 seconds, debating if I would follow the rest of the runners turning around or if I'd follow through on my plan to DNF and just run to the finish line. "I hate this sport," I thought as I flung my water cup down and summoned what little willpower I had left to return to the course. My watch gives me mile splits and the results were just dismal. A lot of 9:30 and 10 minute miles. I stopped looking at my watch and walked here and there. My time was trashed, so what did it matter if it was trashed a little or a lot? Now, what I had yet to realize (and what I woudn't realize until I crossed the finish line), is that somewhere along the way, my Garmin had lost the satellite feed. Which meant my mileage was off. Which meant that, unbeknownst to me, I was actually moving faster than I thought I was. Then, about 1.4 miles out from the finish area (which I'm still thinking is about 2.5 miles from the end), I got my second wind. I know. What the heck? But I started cranking out an 8-minute pace and was like, "Well, at least I'll finish. That's something." I decided to save a little for the end and eased up a bit only to come to the finish area and... cross the finish line. No circling the lot needed. Done. My time? 2:45:23 - a PR for me on this course. Are you kidding me??? What just happened?? So it was still a bad run, but a bad run that resulted in a PR. Very odd. I wish now I'd run the race without my watch. Thinking I was going to run an 8:30 pace on a muddy trail was wrong thinking and I unnecessarily tired myself out early on, determined to hold pace. I also lost all motivation when I started seeing those 10 and 11 minute miles. I felt like I was going faster than that and that just depressed me even more. I suspect if I hadn't seen the numbers I would have been more motivated to keep moving for a longer time. Anyway, for better or worse, that was my run. I'm trying not to let it affect my thinking for Savannah, although it's hard not to. Once you face up to the fact that you were wiling to quit a race, it settles into the back of your mind. In fact, that was the one argument I kept giving myself to not quit, even if it meant a really horrible clock time. "If you quit once, you've just given yourself permission to quit in any race," I told myself. So I'm VERY thankful the course was plotted the way it was and I wasn't handed the option of quitting as I'd planned. I'm trying to shake off this race and refocus on marathon training. I think there's just 6 weeks until Savannah.